Bright focusing screen (45 degree) for KIEV-60, 88, 6C, Salyut, Hasselblad. Split image line is on 45 degree. This is a bright split image focusing screen with grids, split image (Fresnel lens) and microraster. Easy and fast installation to camera even by non technicians without changing the adjustments. You should just uninstall your old screen and install this bright screen instead. Special hight quality optical plastic. Brand new, made in Kiev by Arsenal factory. On default installed on Kiev-88 CM cameras. 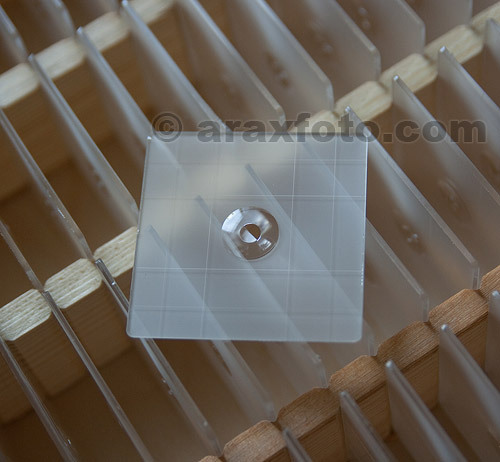 Checked and approved by ARAX technicians: clean, no marks, no scratches. Not fit to Pentacon SIX TL, but fits after little modification. Fits to Hasselblad 500CM/503CW cameras perfectly. All you need to do is pop the standard Hasselblad focusing screen out of its metal frame, insert the Araxfoto screen into the frame, and pop it back in the camera. It took two minutes to do, and the viewfinder image is so much clearer, the split circle really helps focusing. All ARAX cameras already has the brightest screen installed. If you need additional grids for screen, you can buy an extra inserts for focusing screen which you should just put over the focusing screen.